Some people just shouldn’t open their mouths. One doesn’t have to look any further than the excellent (and blogrolled) spEak You’re bRanes to learn that. That site alone shows the dangers inherent in allowing people a soapbox and an audience. And now there’s example number two: Mark Tamburro. Cool, good-looking bloke who just works there and will be moving to South Africa soon. 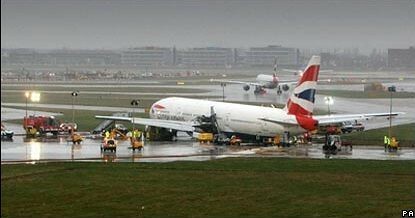 Mark was on the BA038 flight whose engines apparently failed on final approach to Heathrow last week. Bloody lucky to be alive. But now Mark is on the BBC website (and many others) moaning about how crap the staff at the airport were, landing himself (if not his plane) quite neatly into the pompous arse group and reminding us of his disappointing inclusion in the bloody lucky to be alive category. He said the BA staff who were looking after the passengers rationed water, the only drink which was initially offered to them in the departure area, and did not offer any food. His story doesn’t quite tally with this post from one of BA’s ground staff at Heathrow though, which makes very interesting reading. And it’s also interesting to note that he seems to be the only one of the 136 passengers that’s whining about their treatment. A quick google of Mark shows us that he is a little overweight, owns a bit of a racehorse called Cossack Dancer and has a beard. It also tells us that he writes letters to the council moaning about them setting taxi fares so high in South Oxfordshire. Except that, as any fule kno, the council doesn’t actually set the taxi fares in South Oxfordshire. Oops. Is this painting a picture for you, too? People like Mark annoy me. He’s just been fortunate enough to survive a plane crash in which even the pilot thought “everyone on board was going to die” and all he can do is whinge. I think that Mark might just be setting himself up for a little bit of extra cash from his compensation claim. Incidentally, since Mark works for Nokia, he may be the perfect person to explain to investigators, BA and Boeing as to why the plane’s computer system didn’t respond, as he’s obviously an expert on crap, bug-ridden software. Ooh look! It’s back (by popular demand). Please THINK before you comment. I’m in a particularly “deletey” mood today.